There are many tough and lovely native wildflowers that belong in more gardens but are overlooked and underappreciated. Many of them may even be rare or listed endangered plants, even though they are surprisingly prolific and low-maintenance. The common purple coneflower, a species found in many butterfly gardens and even commercial landscapes, is actually a state listed endangered species which only occurs naturally in Florida in Gadsden County. The common purple coneflower (Echinacea purpurea) is actually a state listed endangered species that only occurs naturally in Florida in Gadsden County. Photo by Steven Katovich, USDA Forest Service, Bugwood.org. The native wildflower in which I wrote this article to praise, prairie coneflower, is also uncommon in the state. In all of Florida it occurs only in Jackson and Gadsden counties. Like the purple coneflower, it is found there in open woodlands with exposed limestone outcroppings. Invite it into your yard though, and you will find it happily adapts to a variety of soils. Just like purple coneflower, prairie coneflower seems to tolerate our naturally acidic soil, although I have found they both respond with increased vigor if you raise the soil pH to make it more alkaline. To do this you can purchase and apply dolomite lime in dust form. But I love the look of a few limestone rocks placed in my garden next to plants that prefer a high pH; this raises the pH of the soil near the rocks and creates a more aesthetically natural setting. Prairie coneflower is a long-lived and tough wildflower that is more common further north in the prairies of the Eastern United States. It grows best in full to part sun, reaching two to three feet tall, although some plants will reach four feet. This height variability is common in native wildflowers. Natural variation in their genes make them less uniform in their visible traits than selected or hybridized varieties. Some might bemoan this lack of uniformity, but I love seeing the little differences between individual plants within the same species. In one patch of native wildflowers, it’s common to see variance in size, shape, or color of their blooms; and those are just the visible differences! These variations allow them to be flexible and adaptable to changes in their environment over time. Tiny sweat bees forage for pollen and nectar on the composite flowers of prairie coneflower. Photo by Lilly Anderson-Messec. 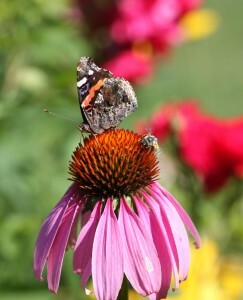 Despite its name, prairie coneflower is not closely related to purple coneflower, and this is visible in its distinct foliage: pale gray-green and pinnately divided. Even when not in bloom, the foliage is an attractive addition to the garden. The long-lasting flowers appear in late spring through summer, with drooping yellow petals surrounding a center cone, reminiscent of shooting comets or even tiny hula dancers. 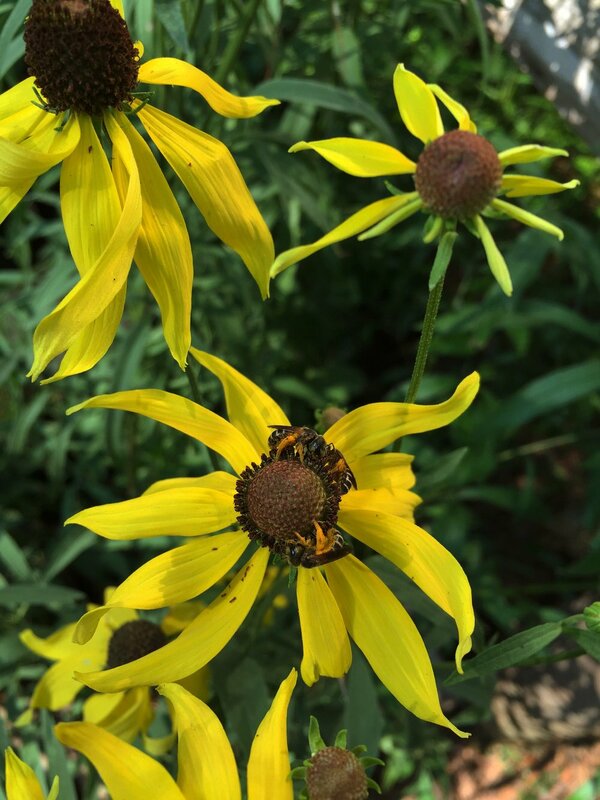 Prairie coneflower has composite blooms, meaning that the center “cone” is actually a mass of many flowers; making it highly attractive to bees, butterflies, and other pollinators. The center cone begins a gray-green color, slowly turning brown as the small individual flowers on it open. Once the blooms have faded you can cut them back to encourage the plant to produce even more blooms: this is called “deadheading”. If you allow the spent blooms to stay on the plant, they will ripen their seed and provide tasty treats for songbirds. This will also allow them to reseed and form a nice patch. Ironweed, blazingstars, purple coneflower, dotted horsemint, and other summer blooming wildflowers are complimentary companions to prairie coneflower in the garden. I recommend all gardeners consider this addition; you will be rewarded with a multitude of blooms, bees, and butterflies to accompany them.